I have been driving my car for nine years. Aside from some minor issues, my car is still running strong. The keys to my car’s longevity are three things: Regular maintenance, never allowing anyone else to drive my car, and never allowing anyone other than a certified Honda dealership to service my engine (especially not Pep Boys). As long as the engine oil is changed regularly, and you make sure that fluids (transmission oil, radiator coolant, etc.) are clean and their levels are always acceptable, the powertrain in a brand new Honda will last at least 100,000 miles. I took my car to a Honda dealership for some routine maintenance and the techs did an inspection as well. The service manager gave me a rundown of all the things that needed to be done to my car. Two of the things that the manager suggested were an engine air filter replacement and cabin filter replacement. 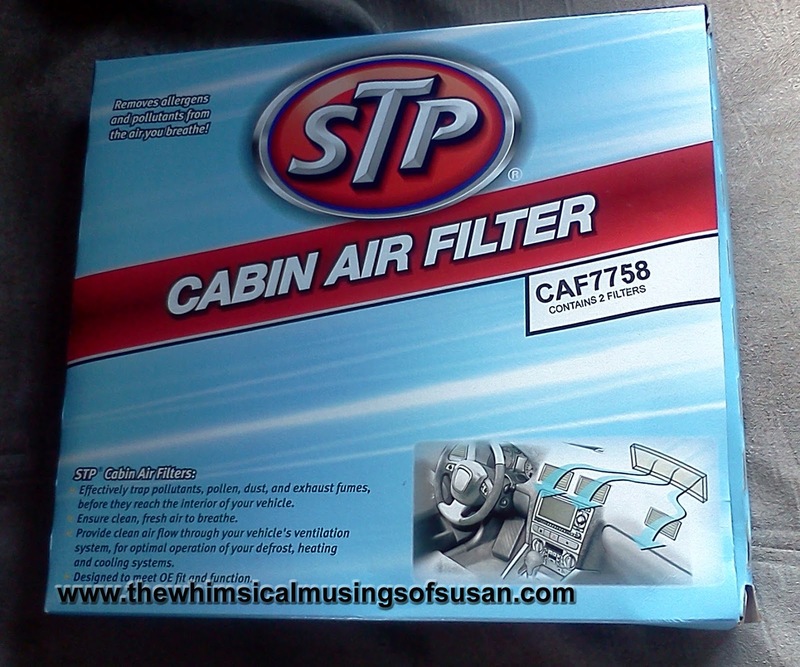 The cost for a cabin filter replacement at the dealership would be $70 and the cost for an engine air filter replacement would be $37. This does not even include any additional fees and taxes that the dealer may charge. 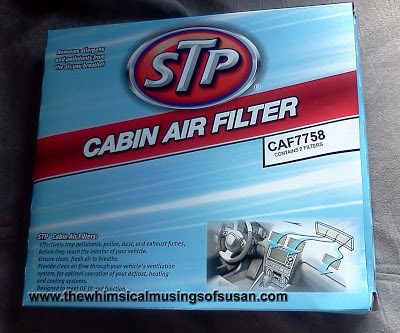 I knew that the cabin filter needed to be replaced for sure, because I could smell the dust and mold whenever I run the A/C in my car. Replacing an old engine air filter may help to improve your car’s fuel efficiency as well. Dealerships usually charge a premium for most services that are performed on the cars that they service, versus what a regular ASE certified mechanic’s shop would charge. I decided to have my boyfriend take care of this for me, since the procedures for these are not complicated. A person that is pretty handy can do these two things without causing any damage to their Honda. So we let the automotive techs at the Honda dealership do the oil change, and then we went to some auto parts stores to price the parts. The first store that we checked out was Advanced Auto Parts. They didn’t have either of the parts that we needed in stock. Also, the parts were a little more expensive than other places. Next, we went to Autozone, which is my favorite place to shop for things related to automotive. 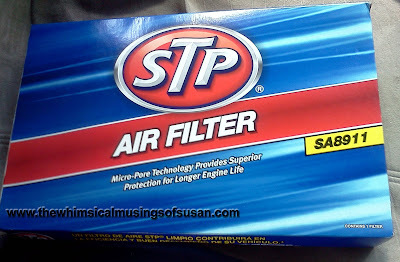 I was able to get an STP cabin filter, which comes as a two pack, for $16.99. The STP brand engine air filter cost $13.99. Now I know that I probably could have gotten these parts more cheap online, but I feel more comfortable purchasing auto parts in a brick-and-mortar retail store. On top of this, I really wanted to get this aspect of my auto’s maintenance done and over with instead of waiting for a package to arrive in the mail. I guess you could say that I was too impatient (and lazy) to do online research for cheaper auto parts. The Honda Engine Air Filter that was removed. As you can see it is dirty. The process of changing both the cabin filter and engine filter in a 2003 Honda Civic is so simple. If you dare to do it yourself, there are some You Tube videos that can show you how. Or, you could look it up in a Chilton manual or other auto repair guide/resource. One of the employees at the Autozone store actually showed us how to replace the cabin filter. I would have given him a tip for all his help, but Autozone employees aren’t allowed to accept tips from customers. In order to get to the cabin filter, it is necessary to remove the door to the glove compartment. No big deal, though. 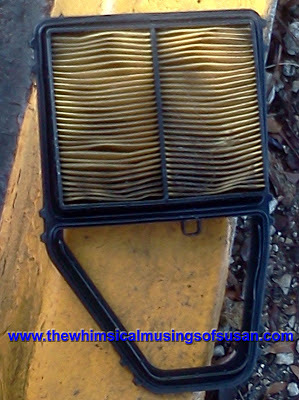 If you decide to change the cabin filter yourself, make certain that you don’t throw out the plastic case that houses the cabin filter. We almost did, but the Autozone employee stopped us from doing so. My boyfriend changed the engine air filter in a matter of minutes. I am really happy that we got these things done without spending an arm and a leg- thanks to Autozone.